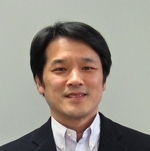 Professor Toshinori Kinoshita at the Institute of Transformative Bio-Molecules; Dr. Yin Wang, designated Assistant Professor for the Young Leaders Cultivation Program; and their coworkers have developed a technology to induce stomatal opening and enhance plant growth. Their paper was published online in the Proceedings of the National Academy of Sciences of the United States of America on December 23, 2013. Plants produce energy by photosynthesis, which requires water, light, and carbon dioxide (CO2). Plants uptake CO2 through stomata on their leaves. If the stomata open more widely, plants absorb more CO2, increasing photosynthesis and promoting plant growth. However, an artificial technique to enhance stomatal opening has not been developed. Previous studies have determined that three factors are required for light-induced stomatal opening including the blue light receptor phototropin, a proton pump, and potassium channels. 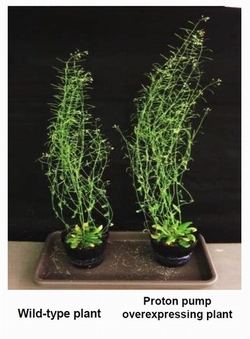 Prof. Kinoshita's research group produced three different Arabidopsis thaliana plants, each overexpressing phototropin, proton pumps, and potassium channels, respectively, and observed stomata and growth in each plant. 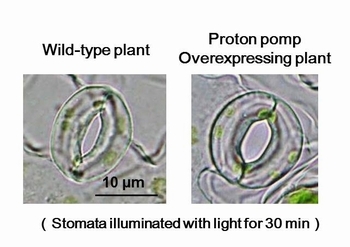 As a result, stomatal opening in the plants with overexpressed phototropin and potassium channels was equivalent to that in wild-type plants, whereas that in plants with overexpressed proton pumps was enhanced by 25%, compared to that in the wild-type. The enhanced opening led to approximately 15% increased CO2 uptake, and the plants grew to approximately 1.4-1.6 times its wild-type equivalent. The novel technique proposed in this research required genetic modification; however, Prof. Kinoshita is currently addressing the development of a new method to activate the proton pump using a compound to enhance plant production. It is widely expected that their studies will contribute to increasing food production and environmental improvements in the future. Professor Toshinori Kinoshita has communed with nature since childhood, and has enjoyed gathering, breeding, and cultivating plants. Plants bear oppressive summer heat and severe winter cold and he has been impressed by this hardiness of plants. He chose to be a researcher when he was assigned to a laboratory during his senior year in college. He found it challenging that students and academics discussed concepts on equal footing and that they opened up new frontiers in research together. He is currently a principal investigator at the Institute of Transformative Bio-Molecules, and is working to develop new molecules that can bring changes in plants in collaboration with researchers in various fields. "The technology developed in this research uses a common mechanism in many plants, and is broadly expected to be applied to various plant species. However, the method requires genetic modification, which can be a huge barrier in application. At present, I am developing a compound to effectively activate the proton pump and aim to develop a method to enhance plant production without using genetic modification." "I believe thrills and spills come first in research, besides knowledge and technologies. What excites you most in your life? For me it is plant research. I am keen to see young people challenging and broadly seeking their interests." Dr. Yin Wang has researched plants using physiological and ecological approaches at various institutes in China and Japan, including Peking University, University of Tokyo, and Nagoya University. She read and developed an interest in an article authored by Professor Kinoshita on blue light responses by stomata. She has conducted physiological research on the relationship between stomata and photosynthesis and in 2011 she joined Professor Kinoshita's research group as a postdoctoral researcher. Since March 2014, she has been studying and teaching as a designated Assistant Professor for the Young Leaders Cultivation Program at Nagoya University. "Stomata play important roles in absorbing CO2 for transpiration and photosynthesis in terrestrial plants. The stomatal response affects not only individual growth but also hydrological and carbon circulation at the global level. I aim to elucidate the comprehensive mechanism of the switch in stomata and will contribute to food production and environmental conservation by controlling stomata in the future." "I would like to share some words of Confucius, "To merely know is nothing compared to being interested to know, being interested to know is nothing compared to deriving joy from learning it." Your interest and enjoyment are the biggest motivations for research."